← How to rotate the page when converting HTML to BMP? PCL is a kind of digital printed document created in the Printer Command Language (PCL) page description language. PCL which is used by Hewlett-Packard printers in the 1980s and now used by HP LaserJet printers and others describes the layout of text and graphics for the document. If you want to convert document of Microsoft Office word to pcl format file, you’d better use a convenient and easy-to-use tool to help you. docPrint Document Converter Professional will be a good choice because it is a software product that dynamically converts MS Office 97/2000/XP/2003/2007, WordPerfect, AutoCAD DWG, PostScript, Adobe Acrobat PDF and many other document types to Adobe Acrobat PDF, PostScript, EPS, XPS, PCL, JPEG, TIFF, PNG, PCX, EMF, WMF, GIF, TGA, PIC, PCD and BMP etc formats. It works in GUI version ,Command Line version and virtual printer. With docPrint Document Converter Professional you can convert your documents from and to 50+ formats easily. There are two virtual printers in docPrint Document Converter Professional which can be called as docPrint Pro for short. They are docPrint and docPrint PDF driver. The leading role in this article is docPrint which can be seen as a document converter, too. 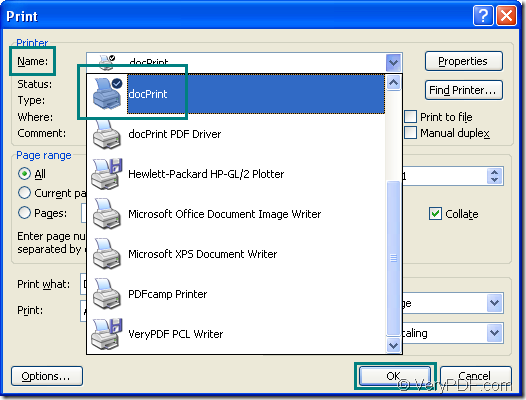 docPrint is easy-to-use, just print a document to docPrint, you will be able to start using document printer software. 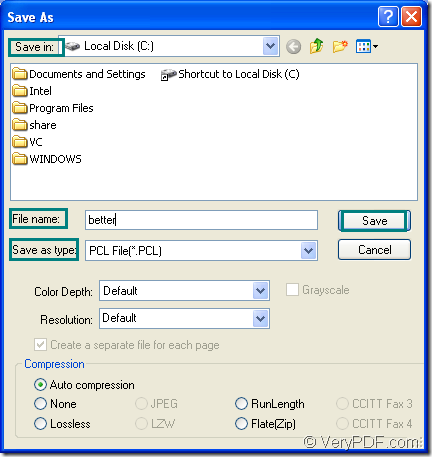 You can use docPrint in the conversion of word to pcl by downloading docPrint Pro at http://www.verypdf.com/artprint/docprint_pro_setup.exe. Or download docPrint standard version which is cheaper than the Pro version at price at the website http://www.verypdf.com/artprint/docprint_setup.exe. 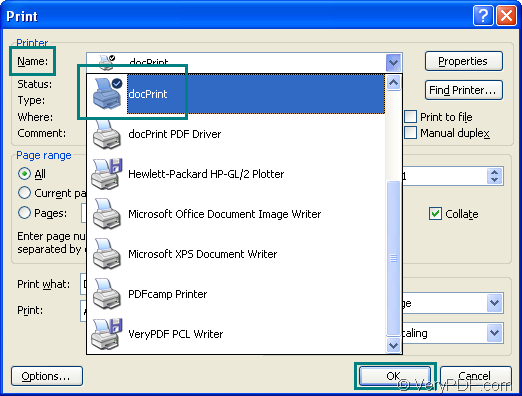 If docPrint is the default printer on your computer, you can right click on the word document and click “Print” option to run docPrint directly. If not, you can open the document and click “File” and click “Print” in dropdown list to open “Print” dialog box. Then choose “docPrint” as the current printer in “Name” combo box and click “OK” button to continue your work. Please see Figure1. The hot key “Ctrl”+ “P” will also do you a favor to open “Print” dialog box. In “docPrint” dialog box showed in Figure2, you should cut to the chase to open “Save As” dialog box if you don’t need to set parameters to the target file. The first way is to click “File” and click “Save as” in the dropdown list. The second way is to click on the icon in the toolbar. The third way is to press “Ctrl”+ “S” on your keyboard at the same time. Then you will see a new dialog box box named “Save As” pops up, please see Figure3. In this dialog box, you can do some changes to the target file and run the whole conversion. In “Save in” combo box, you can specify the path for the target file. In “File name” edit box, you should type in a new name for the target file. 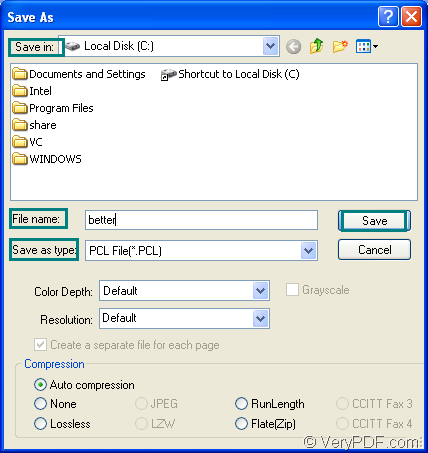 In “Save as type” combo box, please choose the right output format for the target file, last please click on “Save” button. As you can see, the whole conversion of word to pcl is so easy that everyone can master the process in a short time. So just download the docPrint Pro and experience it yourself! How to convert MS Office PowerPoint documents of PPT to PCD? This entry was posted in docPrint Pro and tagged word to pcl. Bookmark the permalink. One Response to How to convert documents of Microsoft Office Word to PCL? Looking to produce PCL files from Word Documents, although only certain pages from documents. Printing the document to PCL seems to be the easiest way to achieve this. I have downloaded the Pro version of DocPrint which is working but it outputting each PCL page as separate files. Is there a way to output all the pages for one document as one PCL file.